Particulate matter pollution is a growing concern. There were 31 yellow PM 2.5 days and 36 total (pm and ozone) yellow days. Roanoke Valley experienced 90 percent good (green) air quality days during 2014. Roanoke Valley experienced 10 percent moderate (yellow) air quality days. There were no unhealthy for sensitive groups (orange) air quality days. June and August both had 6 moderate, yellow AQI days. 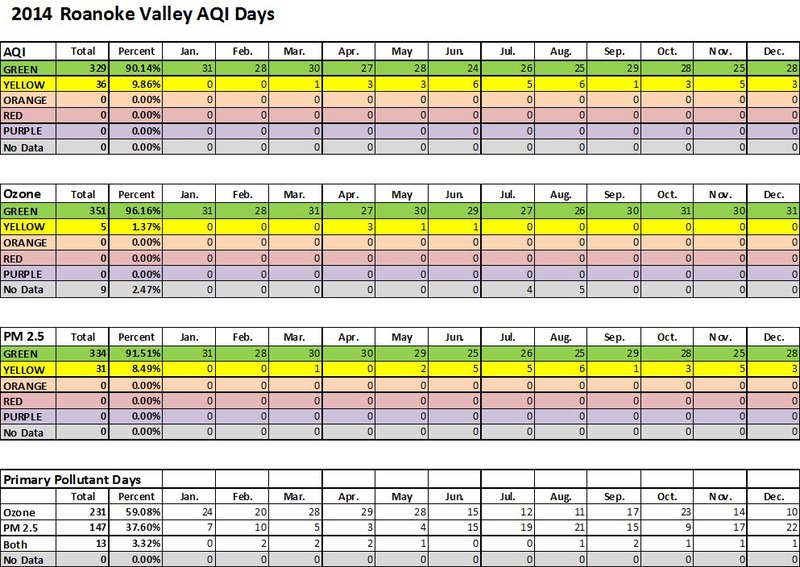 July and November both had 5 moderate, yellow AQI days. January and February had 0 moderate, yellow AQI days. All days were good, green AQI in these two months. There were only 5 moderate, yellow AQI days for Ozone in 2014. All 5 of those were barely in the moderate range with AQI of 54 the highest. Ozone concentration of 60 ppb (AQI 51) was the 4th highest concentration which will be used for design value. The last time the Roanoke Valley had an ozone exceedance, orange AQI, was 6/29/2012 (concentration of 77 ppb, AQI of 104). There were 31 moderate, yellow AQI days for PM 2.5 in 2014. Highest 2014 PM 2.5 concentration was on July 2 (29.2 ug/m3, AQI of 87) which was likely due to a small brush fire on Tinker Mountain which was only six miles from VA DEQ air monitor. More on air quality here. This entry was posted in Uncategorized and tagged aqi, ozone, pm 2.5. Bookmark the permalink.